For nearly four years, there's been a drip, drip, drip of details spilling out about Anthony Bourdain's long-delayed and hotly anticipated international food hall project on the far west side of Manhattan. Just this past summer, the globe-trotting celebrity chef even teased more about what exactly it would look like. However, on Friday, the food world maverick declared the project dead in the water, quite literally, and that he is cancelling his ambitious plans open Bourdain Market at the Pier 57 development. In an official statement obtained by Eater, Bourdain spelled out why he's pulling the plug on the Pier 57 plans. "Launching what is admittedly a very ambitious venture has proven to be challenging at every turn,” he said. 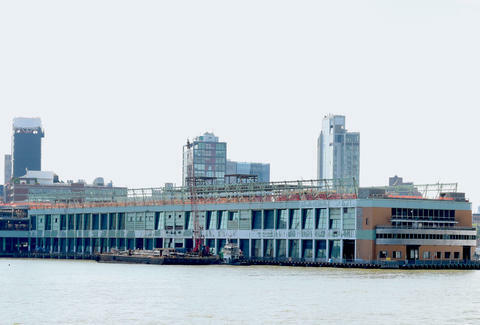 “It seems increasingly clear that in spite of my best efforts, the stars may not align at Pier 57 which is an especially complicated site for which we still do not have a lease." Despite the considerable excitement surrounding the project -- it's been hyped by the likes of The New York Times and Governor Andrew Cuomo -- the truth is that it's been fraught almost since the beginning. Bourdain, for his part, has been frank about the difficulties of creating an authentic international food market, and rumors of challenges facing the project previously culminated with news that its opening date had been pushed back a whopping three years. In addition to Bourdain's lack of a lease for the proposed location, the project's CEO stepped down back in March. Still, it's a huge bummer, for Bourdainophiles and foodies alike. However, Bourdain left open the possibility for a Bourdain Market in a different NYC location in the future. So, we'll just have to wait and see what Tony might have up his sleeve.